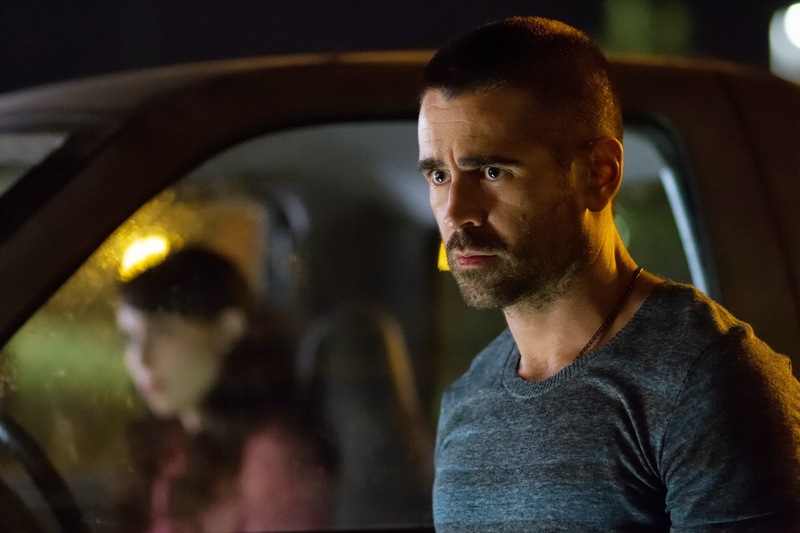 "Dead Man Down" is dark and dour, but it's also nicely shot and well-acted by its two leads, Colin Farrell and Noomi Rapace. I went into this expecting a dumb action movie; instead, it's an interesting meditation on the deep desire for revenge and what that can do to a person's soul. Victor and Beatrice (Farrell and Rapace) have a bizarre chemistry that hooked me from the beginning. Their relationship works so well that it almost overshadows the main storyline. They're neighbors who admire each other from adjacent apartment balconies, and when they finally do meet, it doesn't go the way you might expect. He's a professional killer but tells her he sells real estate; she's disfigured from a car accident and self-conscious of her scars. They're both damaged in their own way. Victor's partner-in-crime is Darcy (an excellent Dominic Cooper), a family man whose wife and baby have given him a newfound perspective about the world and the people in it. They work for Alphonse (Terrence Howard), a criminal kingpin who has been receiving threatening packages for the past three months. That mystery is what drives the plot forward. F. Murray Abraham, Armand Assante, and the great French actress Isabelle Huppert all show up in small supporting roles. Huppert appears in so few American films that it's curious she'd pick this one. She plays Beatrice's mother, a hearing-impaired woman who obsesses over getting her Tupperware back. (In a particularly silly scene, she fumbles for her hearing aids while the people around her plan crimes out of earshot – yeah, that's believable!) It's always nice to see Huppert, but her only purpose in the movie, it seems, is to show that Beatrice still lives with her mom. WWE wrestler Wade Barrett is also in the cast, but if he's the only reason you want to watch this, don't bother. He barely speaks, and he's unintelligible when he does. His thick English accent is an asset as villain in the ring, but it's a definite drawback here. Mostly, he just stands around and tries to look menacing. 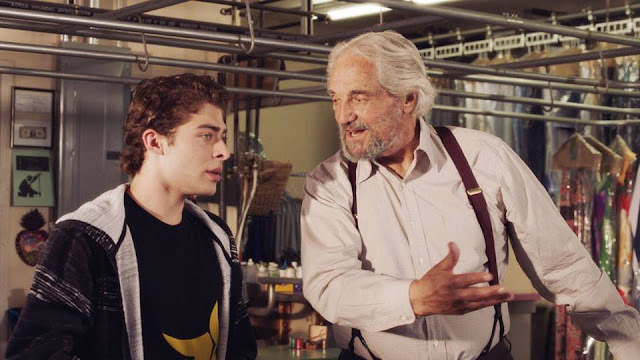 Unfortunately, he's ridiculously taller than his co-stars and lurches like an awkward Herman Munster. This is especially evident during the mailbox scene. The charisma and charm he showcases on Monday Night Raw is nowhere to be found in his portrayal of the henchman Kilroy. If he has any potential as an actor, it's impossible to tell based on this role; he's given precious little to work with. Even though "Dead Man Down" is set in New York, it has a decidedly foreign feel to it. That's likely because it's directed by Niels Arden Oplev, who helmed the original Swedish version of "The Girl with the Dragon Tattoo" and reunites with its star, Rapace, for this film. Almost everything – from the characters, script, and cinematography – is atypical of the usual American action movie experience. The beginning and ending are unfortunately the exceptions. It starts off like some garish rap video with loud music, fast cuts, and a vomit-tinted green and brown color scheme. I won't spoil the way it ends, but let's just say we've been down this road before. It's a shame because the rest of the movie is unique. The climax isn't bad, per se, just a bit clichéd. It also features some pretty unconvincing special effects. Farrell and Rapace benefit from wonderful character development, but Terrence Howard remains a paper thin villain. His only function is to be a bad guy and chew up the scenery with his evil ways. He does that well, but it would have been nice if we had gotten to know him a bit better too. His motivations are never clear. Why does he do what he does? In this case, the fault lies with the script (which is fairly effective otherwise), not the actor. "Dead Man Down" isn't a perfect movie by any means, but it is an interesting one. It's lighter on the action and heavier on the romance than you might expect, but that's okay because Farrell and Rapace make an oddly compelling couple.